Tired of going through your dailies to create a week/month summary? 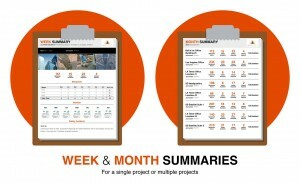 Impress the owner or your boss by providing a quick snapshot of your project's progress. Reports will summarize hours worked, daily weather, delays, accidents and missed reports. Reporting on multiple projects? Don't worry! The Project Summary will include multiple projects in one report. Learn more!